Update: I remembered where I found this quiz, it’s at Rayela’s Fiber focus blog. Update to Update: The top score is higher than 100. Oops. This entry was posted in Color and design and tagged Color theory, hues, quiz. Bookmark the permalink. 5 Responses to Color Quiz! 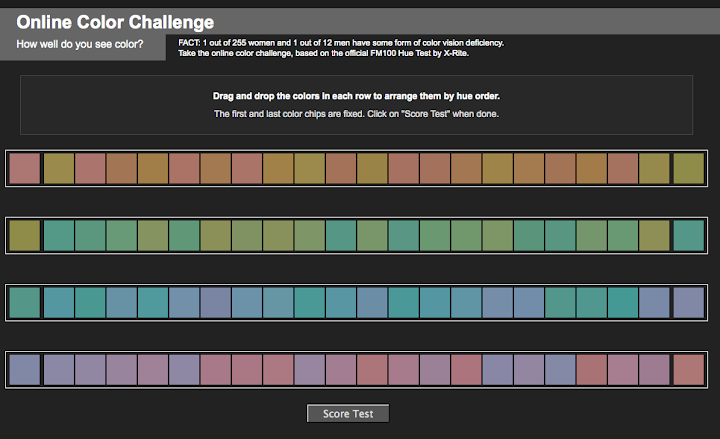 Enjoyed the Color Quiz. I scored an ‘8’. Will pop back in here and get my daughter to give the color quiz a try. I got an 8! WOOHOO! What a great site – thanks for the link! And I love the little mouse you’re working on – the shading looks fab. I got 172. I am male, and I am color-blind. oh whoops, I guess the top score is not 100. Guess I better correct the post! By the way, I’ve been reading your blog for a while, I love your work.